Για αυτούς που τα μόνα παράθυρα που έχουν αξία είναι τα τηλεοπτικά, κάθε ανοιχτή πόρτα θα είναι πάντα επικίνδυνη. Ακόμα και αυτή μιας παιδικής χαράς. Για να μην τους θυμίζουν αυτούς που θα ήθελαν να μην υπάρχουν καθόλου (εκτός σαν απλήρωτοι εργάτες). Γι αυτούς που για να πετύχουν τα μισάνθρωπα σχέδιά τους δεν διστάζουν να πουν τα πιο πρόστυχα ψέματα, για μεταφερόμενους από τη Βίλλα Αμαλίας μετανάστες και νοικιασμένα παιδιά στην παιδική χαρά. Γι αυτούς που τόσο απλόχερα τους χαρίζεται τηλεοπτικός χρόνος και αστυνομική προστασία και λεονταρίζουν μόνο εκ του ασφαλούς. η λέξη αλληλεγγύη είναι άγνωστη. Η μόνη πόρτα που θα κλείσει είναι η δικιά τους. Η ζωή ανήκει σε άλλους. 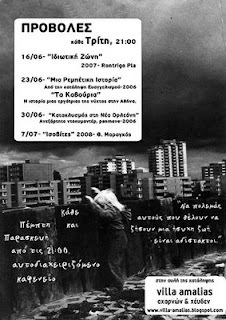 The incidents that have happened the last weeks in the area are so clear that they speak by themselves: the racist gathering of May 28 at Omonia square that was called by the neo-Nazi organization Xrisi Avgi (signing as “committee of greek citizens”) and the attack they made –together as always with the MAT police force- to the occupied place of the old court at Sokratous street where hundreds of immigrants and refuges found shelter. The police occupation at whole neighborhoods with the extreme action of the repressive attack of May 20 where hundreds of cops made their presence almost to the whole Axarnon street and made hundreds of checks and taking people to police stations and made dozens of arrests. Because of all those police actions the rightful rage of the immigrants was triggered. The 46 arrests and the beatings that followed the fighting demonstration of May 22. 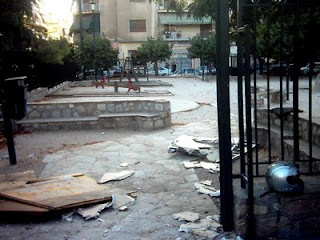 The arson attack that happened the same night against a Muslim worship house at Attikis square and had as a result the injuries of five immigrants. The aggressiveness by the asholes of the “committee of citizens and shop owners” at Ag. 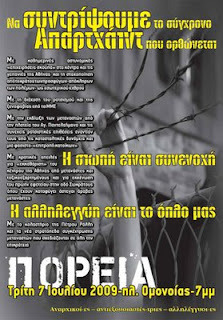 Padeleimonas against the leftist people and the pogroms against the immigrants that happened (always with the help and tolerance of the police) at May 23 and 24. All these all so loud that is impossible to misinterpret. Within this condition there is no room for silence and passivity. The racists, the worshipers of the dictatorship and the “respectable” people of the “committee of citizens and shop owners” at Ag. Padeleimonas, together with the para-state fascists believe that the time has come to develop their actions like the modern assault battalions of this small Middle Ages. The requests of those who are the most obedient and the most bragging and cowardly subjects are the same as the state’s planning and include “cleaning operations”, beatings, arrests and tortures of immigrants. Those who demand quite, order and security, dream of the apartheid, nights of the crystals and crematoriums. the neighborhoods and the squares belong to everybody. crawl back to your holes!